Escape the resort and find your line on a backcountry skiing tour. Glacier Adventure Guides now offers backcountry skiing trips in Flathead National Forest. Earn your turns on a guided tour of some of the best ski terrain in the state. On clear days, views of the huge mountains of the Great Bear Wilderness and Glacier National Park are breathtaking. On the slopes above Dickey Creek, you’re sure to find the run of a lifetime. In remote settings like ours, we rarely cross paths with other skiers. Whatever you’re looking for, our avalanche-certified guides can find you a line you’ll love. Participants must provide their own skiing and avalanche gear. Please note that access to our permit area includes a three-mile skin in and out. A cat shuttle is available from the Izaak Walton Inn for a fee. Day trips: Meet at the Glacier Adventure Guides office at 9 a.m., where we will drive to the trailhead to begin the day. We also offer a shuttle service to pick guests up from their lodging at 9 a.m. Full day ski tour, return to Columbia Falls before 5 p.m.
*Izaak Walton Inn Guests: Meet downstairs at the guide kiosk at 9 a.m. Load up and head to the trail, full day ski tour, return to the Inn around 4 p.m.
Glacier Adventure Guides leads backcountry ski tours to the Dickey Creek Drainage above Essex, Montana. Our ski tours require moderate off-piste ski skills and a reasonable level of fitness. Everyone earns their turns in the Middle Fork. above Dickey Creek on a sunny powder day. The slopes above the mountain village of Essex are a backcountry skier’s dream. 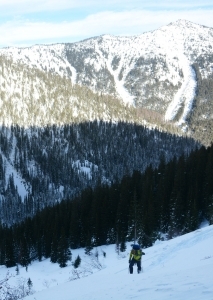 Tucked away in John F. Stephens Canyon, the glades and chutes of Dickey Creek offer deep powder and long runs. A cat shuttle to the slopes is available to and from the Izaak Walton Inn for $300. Transportation from lodging to office (shuttle rates: $75 from Whitefish, $125 from Whitefish Mountain Resort). •	OFFERED: JAN. - MAR.